Farming is the main livelihood in Zambia, a country located in Southern Africa. But more than a third of the crops in this country of 14.3 million people never make it to market. 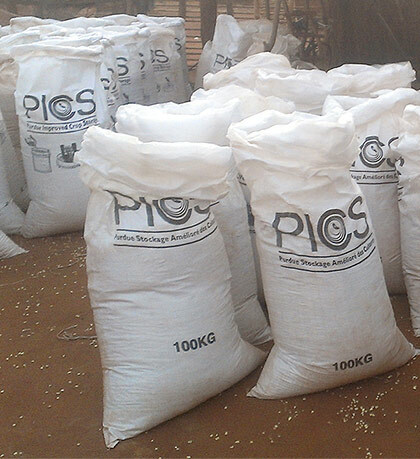 Lacking adequate storage silos, maize — which makes up more than 50 percent of Zambians’ food — is kept in bags in farmers’ homes. Stored this way, many kernels crumble to powder in a few months, having fallen victim to grain-boring insects or mold prevalent in the humid climate. 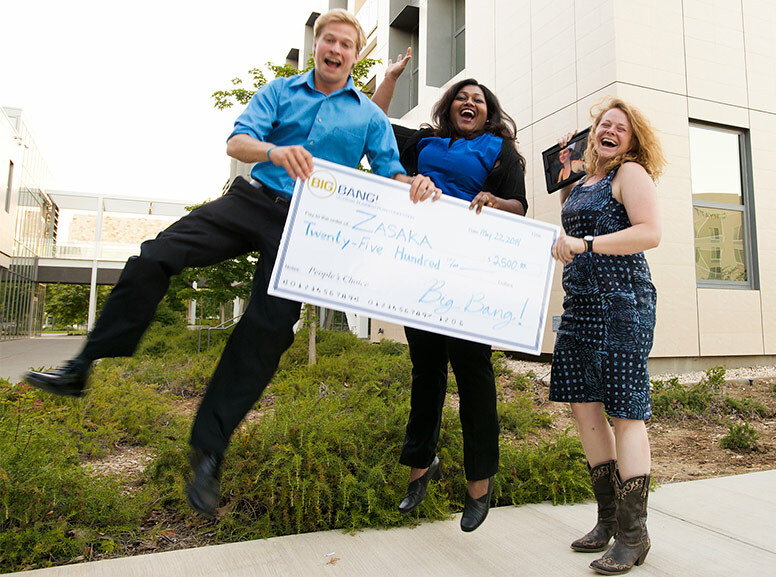 Last year, Zasaka won a combined $5,000 in the annual UC Davis Big Bang! Business Competition, taking both the People’s Choice award and the Ag and Food Innovation prize. The competition is run by the UC Davis Child Family Institute for Innovation and Entrepreneurship, a center in the Graduate School of Management. Another member of the winning team, Kellan Hays, an MBA grad, is still involved in the company. Read more about the Big Bang! journey. This Thursday, May 21, a new crop of Big Bang! finalists will vie for about $40,000 in prizes at the annual competition. Open to the public, the competition and awards ceremony — which includes presentations by team members about each project — begins at 6 p.m. at the UC Davis Conference Center. Now a team of UC Davis grads, students and Zambian colleagues has built a company around simple technologies and practices that aid farmers in avoiding losses and growing more crops. Their first technology is a bag from Purdue University that protects grain without chemicals for just $2.50 per 100 kilograms. “We sold 2,000 bags last year, and we are on target to sell 20,000 this year,” said Rashmi Ekka, an MBA student who will graduate from the UC Davis Graduate School of Management in June. She runs the finances of the company, Zasaka, the UC Davis startup that sells and distributes the bags and other technologies to farmers. Zasaka, which translated from the Zambian national dialect of Nyanja means “it’s in the bag,” is born of UC Davis innovation. Carl Jensen, co-founder, was part of an international team from UC Davis, in cooperation with MIT, that looked at improving postharvest storage in Zambia in 2013. He holds a master’s degree ininternational agricultural development from UC Davis. Jensen specialized in research on soil fertility management and entrepreneurship. The second Zasaka’s co-founder, Sunday Silungwe, holds a degree in developmental studies from Zambia Catholic University and has been working in community development for many years. Zasaka, founded in 2014, currently works with 40 farmers but plans to expand to more than 400 next year. Fellow farmers and conservation leaders receive training from Zasaka to pass on to the farmers enrolled. Farmers enrolled in the pilot saw a 75 percent increase in maize yield from improved practices and seed. This increase and the beans planted between rows have led to more than a doubling of income per hectare. Watch a video about the first year. Both Jensen and Silungwe live and work with farmers in Chipata, Zambia. They hold biweekly training sessions that include discussions on diversifying crops that can be sold and traded with neighboring countries, expanding farm yields, and teaching them how — by using the bags — they can keep most of their crops for later, off-season sales, when prices are higher. The team is also training farmers to teach other farmers in the region. Besides the bags, which are made of three layers of specialized plastic and hold about 200 pounds of grain, Zasaka has developed shellers for maize and nuts, solar lights, and other equipment priced and designed to help smallholder farmers be more productive. Farmers enrolled in the pilot saw a 75 percent increase in maize yield from improved practices and seed. The Zasaka venture wascreated in the D-Lab, which stands for development through dialogue, design, and dissemination. Using technology and working in the fields of energy, agriculture and health, students work with faculty to come up with designs and feasibility studies for real-life projects and businesses in developing countries. The lab works on about six projects a quarter, said D-Lab Director Kurt Kornbluth. A faculty member in biological and agricultural engineering, he worked with MIT in 2004 to develop the curriculum for the D-Lab, which is a joint project with MIT. “This was a great project because Carl (Jensen) started from the ground up in D-Lab. He worked with the local community to understood the need, develop the project and create a local business,” said Kornbluth, a UC Davis mechanical engineering alumnus and GSM business development fellow. He said most projects that succeed take about three years to develop, but Zasaka only took about a year. Jensen, also a GSM business development fellow, said the experience did change his life. Ekka, who attended the UC Davis Graduate School of Management because of its agricultural emphasis and her interest in agricultural economies, came to Zasaka through a different route. After college she founded a nonprofit organization that works on empowering the indigenous people in India. She learned about Zasaka after meeting Jensen at a conference and said it helped fuel her passion for working with underserved communities throughout the world. “It’s great to be working in a company where you’ve identified a problem and you’re solving it,” she said. Jensen agreed, adding that Zasaka is well on its way to reducing the grain market volatility in the region and the risks farmers confront every season.